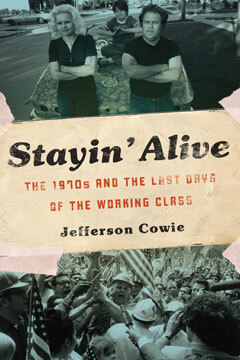 A wide-ranging cultural and political history that will forever redefine a misunderstood decade, Stayin’ Alive is prizewinning historian Jefferson Cowie’s remarkable account of how working-class America hit the rocks in the political and economic upheavals of the 1970s. In this edgy and incisive book—part political intrigue, part labor history, with large doses of American music, film and television lore—Cowie, with “an ear for the power and poetry of vernacular speech” (Cleveland Plain Dealer), reveals America’s fascinating path from rising incomes and optimism of the New Deal to the widening economic inequalities and dampened expectations of the present. Blog by Professor Craig Werner on using Stayin' Alive in his class "Bruce Springsteen's America"